Homebuyers may not realize or appreciate it, but hard at work behind the scenes on their behalf are industry organiza-tions such as the Building Industry and Land Development Association (BILD). In the last few years, given the challenging affordability, supply and policy issues facing the GTA housing market, BILD is not just important but essential to protecting the public interest. 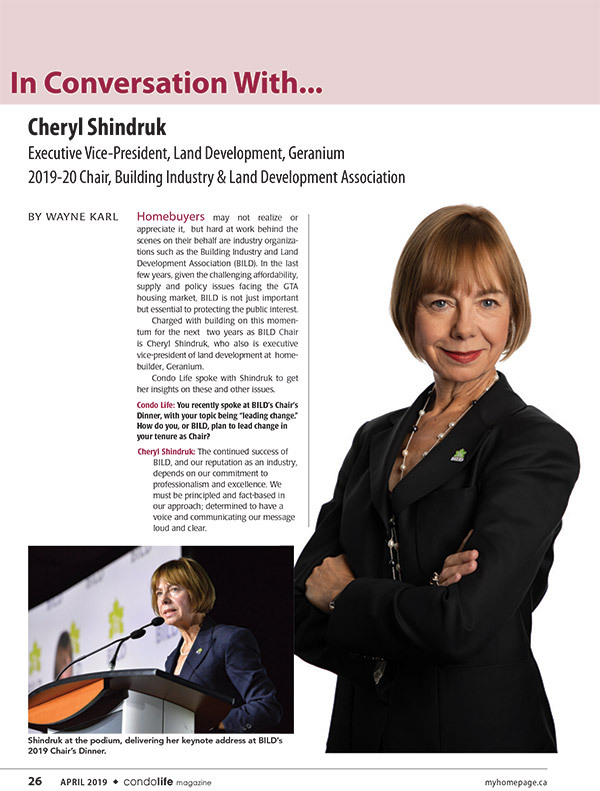 Charged with building on this momentum for the next two years as BILD Chair is Cheryl Shindruk, who also is executive vice-president of land development at home-builder, Geranium. Condo Life spoke with Shindruk to get her insights on these and other issues. 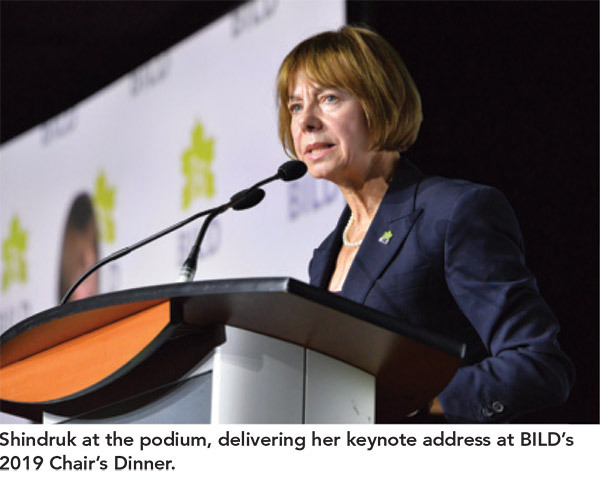 Condo Life: You recently spoke at BILD’s Chair’s Dinner, with your topic being “leading change.” How do you, or BILD, plan to lead change in your tenure as Chair? Cheryl Shindruk: The continued success of BILD, and our reputation as an industry, depends on our commitment to professionalism and excellence. We must be principled and fact-based in our approach; determined to have a voice and communicating our message loud and clear. One way we can achieve change is to continue to focus on educating the public on the role our industry plays in contributing to the high quality of life this region offers, and the challenges we have delivering housing that people can afford, where and when it is needed. CL: What were some of the other key messages in your address? CS: Our advocacy agenda with government achieved some great momentum in 2018. We need to continue our work to help government create a regulatory environment and approvals process that is fair and streamlined, free of duplication, while protecting the public interest, and creates positive conditions that allow our members to build and renovate homes, and places for people to work and play. Collectively, we need to work to restore balance and stability in the housing market. 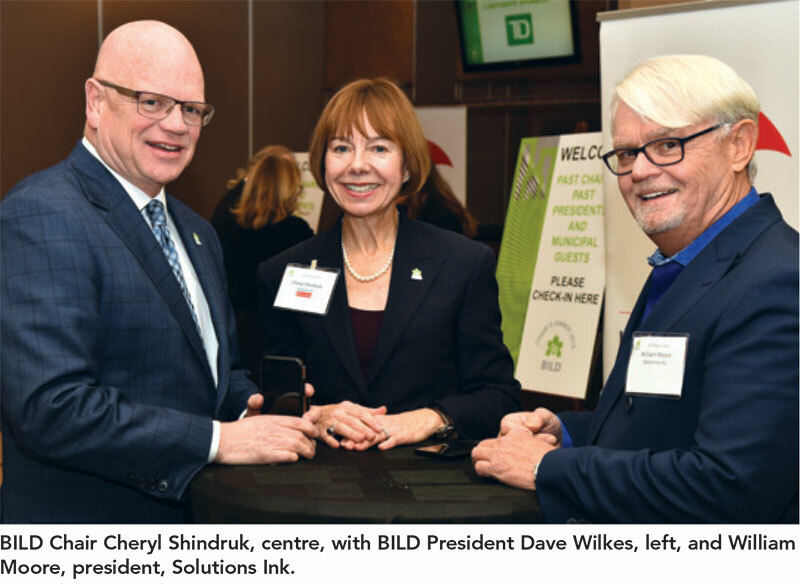 CL: The industry – through BILD, the OHBA and TREB – has made great strides over the last few years in getting governments to understand the challenges facing builders and developers, and therefore homebuyers. What’s your outlook for these relationships – how do you see things progressing over the next year or so. CS: I believe in the power of partnership and collaboration with all levels of government, with the financial institutions, sister construction associations, chambers of commerce and BIAs, with our colleagues in the environmental and resource sectors and, with the media. We will continue to strengthen these partnerships as a means to achieving regulatory environment that allows us to meet the housing, commercial and industrial building needs of this region. CL: Try to look ahead to a year or so from now. What accomplishment would signal your tenure as BILD Chair as a success you would be proud of? CS: Our organization is poised to take on the challenges of 2019. The staff and board of BILD are highly qualified when it comes to talent, experience and work ethic. Advancing our advocacy agenda with government; further educating homeowners and prospective buyers; and restoring balance and stability in the housing market will signal to me that we’ve accomplished what we set out to do. homebuyers – who are growing increasingly concerned about affordability in the GTA. What would you say to them on this and other topics they need to be aware of, to keep their homebuying hopes realistic? Ensure that your elected officials under-stand your concerns and viewpoint, at all levels of government. We are committed to working with government and stakeholders so that our industry can do its part in delivering an ample supply and mix of housing options, and achieving balance and stability in the housing market. We need a regulatory environment and approvals process that allows this to happen. CL: How has your work at Geranium prepared you for your position as Chair of BILD? 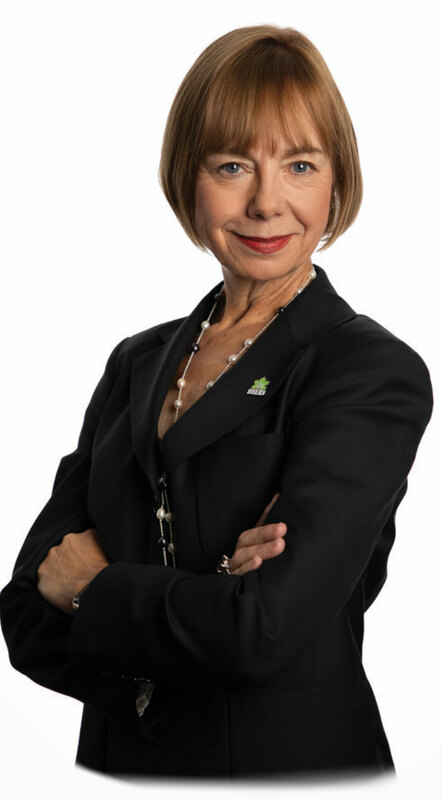 CS: I have been fortunate to have been able to pursue a career that merges my passions for city planning, community building, business and volunteerism. Since joining Geranium in 2003, I’ve had the opportunity to work on many complex and challenging files, receiving guidance and mentorship from outstanding business partners and Geranium’s principals, who lead by example. I’m inspired by our land development team, and we’ve all embraced a strong commitment to communication, consultation and collaboration. This is what helps me most in my role with Geranium and prepares me for the position of Chair of BILD. CL: Let’s talk more about Geranium… What’s in store for 2019? CS: On the sales and marketing side, we will continue to sell and build our design-forward new homes in Aurora, Stouffville, Toronto East and Pickering. With our partners in Friday Harbour, Innisfil, we’re bringing this resort community to fruition on Lake Simcoe. We expect to launch new home communities in Port Perry and Pickering. We’ll also be continuing our planning and development processes on existing land holdings, working with government and agencies to create places which contribute to the diversity of housing styles, employment and lifestyle opportunities, while enhancing the communities we have the privilege of working in. CL: How do you think your work at BILD will benefit you in your day job at Geranium? CS: I value the work of BILD, OHBA and CHBA, which is why Geranium is a member. Our president, Boaz Feiner, was a two-term BILD board member, and Louie Morizio, senior vice-president of construction, has served on RESCON’s board of directors. Whether through a formal role, or in other ways, Geranium and I will continue to have a voice in our industry.